Home / Women In Islam / Is the Niqabi Woman Honoured or Oppressed? Letter From a Niqabi! Is the Niqabi Woman Honoured or Oppressed? 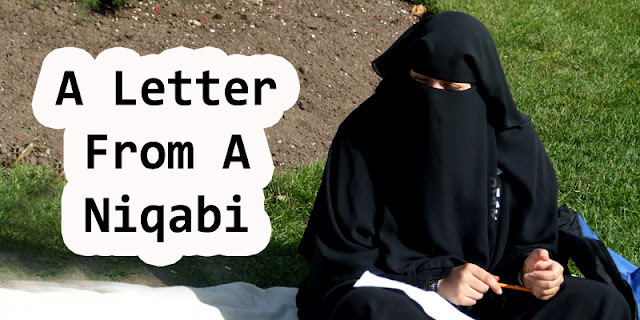 Letter From a Niqabi! They say the eyes are the windows to the soul, so perhaps when people encounter a niqabi woman like myself and feel the need to discourteously ask me to go back to my country, they are just intimidated by the profundity of my soul. However, a more likely reason would be the growing epidemic of ignorance. I often wonder how many people who pass me on the street and think to themselves, “look at the poor, oppressed, brainwashed girl.” It is absolutely mystifying how people could be so adamant in their opposition to something without even attempting to understand it. I have read and listened to a multitude of people expound on their logic behind their animosity towards the niqab. The reality is, most of these people have never even had so much as a conversation with a Muslim woman, let alone a niqabi. The stigma and misconception attached to niqabis are disquieting. Believe it or not, niqabis are actually people just like everybody else, with opinions, and passions. If people took some time out to engage in a conversation with them, it would be made apparent that most of their aversions towards the niqab are baseless. The immediate assumption the public forms when they come across a niqabi woman, is “she was forced to wear that. Her husband made her, her father made her, her brother made her.” Many people appear to be shell-shocked when they learn otherwise. Two years ago, I was sitting at a bus stop and a young high school girl sat next to me. After staring at me for a while she proceeded to tell me, very timidly that she believes I don’t want to wear “that” (pointing to my niqab). Of course, after, I informed her that it was, in fact, my choice to adorn the niqab, her reaction was of genuine shock. It wasn’t even rude, she was honestly mind blown. Fortunately, this encounter can be considered a fortuitous one, as it ended up turning very insightful where she took it upon herself to rectify her ignorance and listened to me with an open heart. It’s incredible how all it took was a single conversation to shift her perspective. THIS NIQAB OF MINE IS MY OWN CHOICE. MOREOVER, IT IS A CHOICE I WHOLEHEARTEDLY LOVE AND EMBRACE. My father was oblivious to the fact that I was even considering wearing the niqab, until the day I actually started wearing it. I am not married, and my brothers are both significantly younger than me, so no man in my life could’ve influenced my decision. However, those who are forced to wear niqab by the males in their lives have been greatly wronged and are indeed oppressed. Those who force it upon women are not following any religion, only their own malicious desires. The preferment to wear the niqab is an extraordinarily intimate one, and it is a means for that individual to enhance their relationship with God. It is my reminder that I am a Muslim woman, honoured by the Almighty, with a much more preeminent purpose. It does not serve the purpose of helping men to keep their sexual desires in check, that responsibly falls on the man alone, regardless of my choice of attire. This liability is ordained by Allah, Himself. The niqab is not a veil upon my intellect and personality. Despite the fact that all niqabis appear to be in uniform, the niqab actually serves to highlight our individuality. Niqabis are the very opposite of demure and narrow-minded. Contrary to popular belief, we are not submissive to any man. We think for ourselves, and our interests and hobbies are vast. We hold strong opinions on a myriad of subjects, ranging from politics to the arts to social issues to religion. Take me for example – I love to occupy my leisure hours reading crime fiction novels. I am ardent in my love for the written word and I am obsessed with skincare and makeup. I am what you would call a “hopeless romantic” and I have a habit of cracking jokes quite often. Under the niqab is a radiant individual whose unusual choice of garments do not function like the moon covering the sun’s glow, rather, it acts to elevate and reinforce the woman. We are doctors, lawyers, writers, artists, educators and anything else you could possibly think of. The niqab is not a hindrance to prosperity. The niqab forces the world to look beyond my corporeal aspects and to fully discern what a person is truly comprised of. In this society, there’s no denying that a woman’s worth has been reduced to their bodies, the “perfection” of their skin, and the size of their lips. Women are shamed and pressured when their bodies no longer have the same youthful, blemish-free appearance before childbirth. Is this the great liberating society I should take part in? If so, no thank you. Every single one of our bodies will coalesce with the very earth we roam, so this fanaticism with appearance is absolutely senseless. While we are fond of the art of makeup and revel in the satisfaction of looking good, the niqab reminds us that all of this is essentially just frivolous play. Our legacy will be in our warmth and compassion, in the lives we have touched, in the number deeds enacted for Allah’s pleasure. Labelling the niqab a symbol of anti-feminism and oppression is both comical and inequitable. We are vehemently reaching out to the world, telling you we are NOT oppressed. The world’s persistent refusal to hear us is incredibly injurious and irreverent not only to Muslim women, but to all women. Everyone is so heavily focused on a woman’s clothing or lack of, that that’s all she becomes… the gentleness of her heart and the brilliance of her mentality is less than an afterthought. If a woman is seen in niqab, it becomes ludicrous to suggest that her innovative thinking has the potential to transform the world. A woman in a niqab is seen as tantamount to an imbecile, complaint to the whims of men. It is time the world puts an end to defining women by their clothing, especially niqabi women and reforming such inaccurate outlooks. The niqabi woman is resplendent and vivacious in character, to portray her as anything else is utterly erroneous. Such grave misapprehensions about niqab is a consequence of ignorance. Ignorance is a disease which can only be cured with impartial questioning and reflection, so open your heart, look beyond the surface and you will discover that Muslim women are positively scintillating.